How Does Traffic Court Work? While most people you know aren't likely Bonny or Clyde-like fugitives from the law, there is one type of infraction we virtually all share in common: violations of traffic laws. Usually, traffic violations are handled with a simple e-payment on your state's website, but in some cases, going to court is an option. There's a good chance you or someone you know has considered fighting a traffic ticket, but make no mistake – traffic court is more than just speeding ticket court. As you might've guessed by the name, traffic courts deal with traffic infractions and other minor offenses. In addition to speeding, traffic court commonly handles issues such as expired licenses, parking tickets, expired registration, driving uninsured, running a red light, running a stop sign, or automobile components in need of repair (like that broken taillight you got pulled over for, other defective lights, faulty exhaust parts, no windshield wipers or mirrors, or even lacking a horn). So while traffic court extends beyond just speeding tickets, it only hears infractions, which are the violations you receive as a ticket, or citation. Driving with blocked vision, including darkly tinted windows, per some regional vehicle codes. Driving with expired license plates. Displaying your license plates improperly. Displaying your inspection stickers improperly. Going the wrong way on a one-way street. Failure to stop or yield to a pedestrian. Failure to submit a report after an accident. Backing into a highway or expressway. Passing in a no-pass zone. Passing a pedestrian who is using a crosswalk. Not displaying your license plates properly. Racing, dragging or otherwise competing in speed contests. Failure to buckle your seat belt or your child's seat belt. Spilling a load on the highway. Violating vehicle-related noise control ordinances. Violating skateboarding or roller-skating rules. Why Go to Traffic Court? Okay, so now you know the types of minor offenses traffic court deals with on a daily basis, but the question remains: Why would I go to court instead of paying a $50 ticket online? In most cases, the answer is that you won't. Paying the fine for your ticket is an admission of guilt, while traffic court should only be a solution if you feel that you are truly not guilty on a solid legal basis. Remember, traffic court is not a place that you go because you don't like the fact that you've been hit with a ticket. As in any other court, you must have a valid legal defense if you're not in the business of wasting your time or the court's time. If you genuinely did not violate the exact wording of the law, you might have reason to appear. Other valid reasons to contest your infraction include; the issuing officer stopped the wrong vehicle; the issuing officer's view was obstructed; there was a provable error in the officer's methodology; or you were going only a few miles over the speed limit – in the twenty or so states with traffic laws that say it's legal to drive slightly over the speed limit, provided you can prove that driving conditions made it a safe choice. Before you decide to take your ticket to court, remember that many of the common reasons traffic offenders offer in their defense are not really legal defenses at all. Ignorance of the law is not a legal defense, nor is claiming that your actions didn't hurt anyone. Likewise, telling the judge that other people were speeding or otherwise violating traffic laws, but you were the only one who got a ticket will not hold up in court. This argument, known as the selective enforcement defense, has no legal value because you've still violated the law. You're not immune to the law just because other people also violate the traffic codes. Once you get into criminal territory, you're outside of the realm of traffic court. While traffic court is equipped to handle infractions, it does not hear felonies or even misdemeanors. Any crime that carries potential jail or prison time will not be handled by a traffic court. When you've decided to take your traffic issue to court, you can most often find instructions on where your local traffic court is located and when you should appear printed right on your citation. To show up for your first date, or arraignment, you often don't need an appointment, but do be prepared to wait – it is a courthouse, after all. After the clerk or bailiff presents a brief explanation of how the courtroom will operate, the judge takes the bench. Usually, the judge starts calling the names of people who have appeared for their traffic violation arraignments from a list in alphabetical order. Once it's your turn to face the judge and state your plea, you have the option to plead guilty, no contest or not guilty. Of course, the latter reason is why you've come to traffic court in the first place. Pleading not guilty sets you up for day two in traffic court. After hearing your plea, the judge will set a date for your traffic court trial and will subpoena the officer who issued your citation to appear in court at that time. If you decide to plead not guilty at the arraignment, the judge may require you to post bail, in an amount that's not usually more than the fine for your ticket. You'll get a refund on that bail if you win your trial. When you arrive at court for a traffic ticket or other type of infraction, you do have the option to have a lawyer represent you, but you're not entitled to the representation of a court-appointed attorney; hiring an attorney or not is on you in this case. Traffic attorneys are an option, as they specialize in fighting tickets, DUIs and related offenses. On the day of your traffic court trial, the clerk calls your case, sometimes issuing a brief description of the facts, before you and any witnesses are sworn in as a group. (Swearing in sometimes happens earlier, though.) Here, you have the option to make a last-minute request known as a motion, preceeded by the statement, "Your Honor, I would like to make the following motion." Requesting more time (or requesting a continuance) before your case is heard. Requesting the dismissal of the charges if the prosecution has failed to disclose the officer's notes after you've made a written request. Requesting a dismissal of the case if the prosecution has taken too long to bring it to trial. If the officer has not appeared, you can also move that the case be dismissed because your right to confront your accuser and cross-examine him has been denied. Typically, the officer who issued you the citation will appear in traffic court, especially for more serious violations. You're more likely to win the case if the officer fails to appear in court, but victory is not guaranteed. The prosecution may make a quick opening statement. You may choose to make an opening statement next or reserve the opening statement until just before your testimony begins. The latter option allows you to tailor your remarks in response to the prosecution's testimony. Next, the judge will hear testimony from the officer or officers, who may present evidence of the alleged traffic violation, such as radar speed readings or applicable surveillance footage. You, as the defendant, or your lawyer, have the option to cross-examine the officer, and to testify and present your own evidence. Both sides may also call witnesses to the stand, though you do have the option to request that certain witnesses be excluded from the courtroom. This legal right helps prevent witnesses from presenting coordinated stories. Finally, each side is given the opportunity to present closing statements to sum up their respective arguments. The judge will then consider the entire case and deliver a verdict once both sides have completed their presentations. In traffic court, there is no jury – decisions boil down to the judge's assessment of your testimony, and it's the judge's authority that determines your punishment. 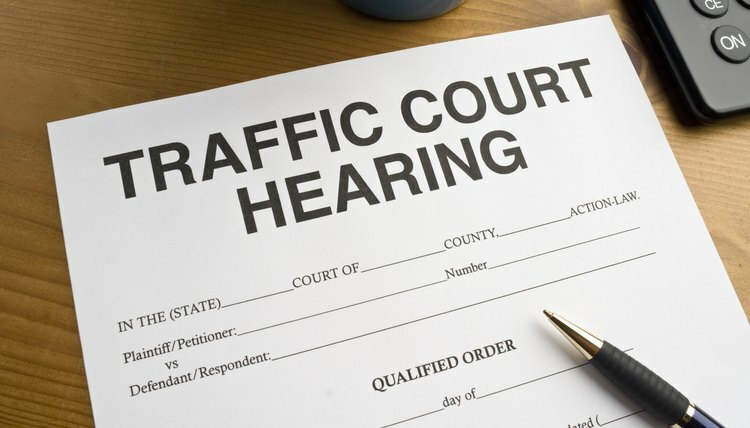 Most states give traffic court judges the authority to reduce the fines associated with traffic violations. If the judge determines that you're guilty of the traffic violation in question, you'll have to pay the fine as shown on the citation. Your driving record may also be taken into consideration, though, which could result in license suspension, per the judge's assessment – especially in the case of repeated offenses. By and large, people go to traffic court to get out of paying a fine, but there's more than one way to do that. Depending on what type of violation you're dealing with, you may request that the judge order you to do community service, rather than pay your ticket. Alternatively, or in addition to your fine, the judge may request that you attend traffic school, a common option if you've admitted guilt, but have an otherwise clean driving record. In most states, completing traffic school removes the violation from your record and exempts you from racking up driver's license points. Under the demerit system used in most states, consequences worsen as you accumulate more points. The judge may also simply choose to reduce your fine based on the circumstances and facts presented. The Superior Court of Los Angeles: What Is an Infraction Ticket? Ketchum, Dan. "How Does Traffic Court Work?" , https://legalbeagle.com/4587671-traffic-court-work.html. 27 March 2019. What Happens in Court for a Speeding Ticket?